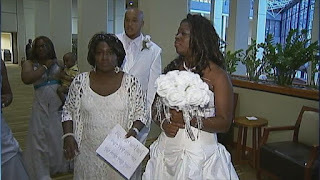 KayKiSpeaks.com: Bride's Atlanta wedding day ruined by 'oily black ooze' from sprinklers?! Bride's Atlanta wedding day ruined by 'oily black ooze' from sprinklers?! A woman blames a hotel in Clayton County for ruining for wedding day just moments before the ceremony was to begin. Shalita Harris and her bridesmaids were prepping at the Westin Hotel in College Park when the hotel's sprinkler system went off, spraying the women with a black and oily substance. EEK! Firefighters and paramedics arrived and five members of the wedding party were taken to the hospital for breathing problems. And in the midst of the commotion, a child's tooth was reportedly knocked out. Needless to say, the ceremony went on with only two bridesmaids as the others were still in the hospital. The hotel manager said only one room was affected by the triggered sprinklers and the cause is still unknown. Umm...can we say lawsuit? Bummer. At the end of the day, Shalita married her best friend and those painful memories will be left behind.